No surprise: player salaries are going up. But they’re not going up by much. This week, we learned that baseball’s average salary cleared $3 million for the very first time, and the minimum salary rose to $414,000. Craig Calcaterra noticed a helpful AP breakdown of the minimum and average salaries over the past 40 years. Craig’s main takeaway is that salaries have risen a lot over the past four decades, and that’s true. But an interesting trend emerges in the data: their climb has significantly slowed. Because the minimum salary is set by the commissioner’s office, its rise has been herky-jerky — during 13 of the past 41 seasons, there was no change, and during another 8 of the seasons, the salary rose by at least 15%. For example, in 1990, the minimum salary increased to $100,000 — nearly 50% higher than the previous level of $68,000. In 2003, after remaining constant the previous four seasons, the minimum salary increased by $100,000, an increase of exactly 50% over the previous minimum of $200,000. The minimum salary tends to go up by windfalls rather than by increments, but the pace of its increase hasn’t appreciably decreased. On the other hand, the change in the average salary has been steadily and notably decreasing. The average salary is still going up, but by a whole lot less than it used to. This instinctively makes sense. The crazy Steinbrenner boom years of the 1970s, immediately following the birth of free agency, caused a salary spike that hasn’t been seen since. (I’m not sure how to explain the crazy outlier 42.5% jump in 1991; does anyone have any idea what caused that?) Salaries have generally increased since the ’70s, of course — with three minor exceptions in 1987, 1995, and 2004 — but their increases are getting smaller and smaller. This year, baseball’s average salary increased to $3,014,572 from $2,996,106; that rise of $18,466 marks an increase of just 0.62% over the previous figure, the smallest percentage change since the average salary suddenly dropped by 2.47% in 2004. The average salary hasn’t increased by more than 10 percent since 2001, and the percentage change has decreased for five straight years. Of course, all of this occurs in the context of a struggling American economy, but the slowing of salary growth is a trend that dates back far before the most recent recession. 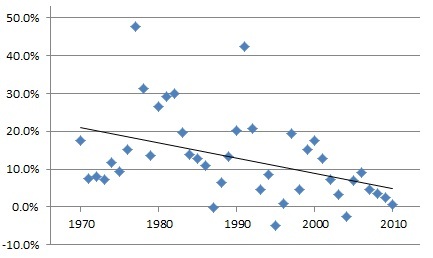 The scatterplot clearly starts moving downward beginning around 1980, and the trend has become even more pronounced since the year 2000. Y2K is a local maximum within the data, the year that the tech bubble burst and Alex Rodriguez signed a 10-year, $252 million contract that is still higher than any contract that any other baseball player has ever signed. 2001 was the last year that the average salary grew by more than 10 percent; this year, it grew by less than one percent. If the free-agent market could have a recession, this is what it might look like. So what does this mean? For one thing, it means that the free-agent market simply isn’t as volatile as it once was. As surprising as the Jayson Werth signing seemed to many, people weren’t shocked by the dollars so much as by the team writing the check. Suffice it to say that there were no stunning $252 million contracts. The very fact that a “mystery team” not only emerged during the Cliff Lee sweepstakes but actually won the day suggests that, while the gap between the richest and the poorest may be widening, the acceleration may be shrinking. And that might not be such a bad thing after all. We hoped you liked reading Baseball’s Decelerating Average Salary by Alex Remington! After awhile, salaries can’t continue to climb faster than revenues. That’s an unprofitable, impractical practice. Example, I work for an online ad agency, and had to convince that despite the iOS:Android impression ratio of 3:1 in June, to 2:1 now, that I didn’t foresee Android’s US share passing iOS until early 2012. There has to be an equilibrium point between them. The same thing holds true here. I think you’ve hit it on the head. Initially, increases were big because there was a big gap between salaries and value. The increases reflect the equilibrium along the “salary/value” asymptote being approached. Put another way, it’s the law of diminishing returns. As salaries approach value to the clubs, the dS/dT fades. This is an interesting counterpoint, I think, to the prevailing notion that the “winner’s curse” will invariably drive free agent salaries past the breaking point. To the contrary, free agent salaries are actually approaching something resembling equilibrium. I think that’s right. Ticket prices can only rise so high in most places, since your average fans’ salary hasn’t been rising all that much over the last 15 years. I know that ticket prices are only part of the revenue stream of MLB teams, but it is an important part. The counter to that is that baseball is still the best deal around, even in major markets like Los Angeles. What has seemed to go through the roof is what surrounds ticket prices, like the cost of jerseys and the like.